The world's smartest man made one of the world's most jaw-dropping mistakes this week when he referred to "Polish death camps," causing outrage to millions of Polish people. For those, like Mr. Obama, who are a little sketchy on items of historical trivia like the Holocaust, Auschwitz and Treblinka were Nazi death camps which were built in German-occupied Poland... and millions of Polish people were brutally murdered by the Nazis. Which, apparently, they're still sensitive about. Astonishingly, despite requests from the government of Poland, Barack Obama has refused to apologize for his gaffe...no doubt because he cares far more about polls than Poles. In a meeting this week with Jewish leaders, Barack "Hussein is Yiddish for Hebrew" Obama insisted that he's a terrific ally of Israel (despite all evidence to the contrary) and, in fact, knows more about Judaism than any other president ever has because...because...he's read about it. Seriously, that's what the man said - capturing perfectly the classic idiocy of the Ivory Tower liberal who believes that books and theory are superior to reality and experience. And frankly, we're skeptical that Obama has read up on Judaism, and suspect that he's actually remembering being stoned out of his gourd in college and giggling during some movie called "Torah, Torah, Torah." But Rabbi Obama wasn't done lecturing his assembled guests, and told them that he was demonstrably in Israel's corner because "all of my friends in Chicago are Jewish" and at the beginning of his career, he was accused of being their puppet. Yikes. So suggesting that he was not part of a Zionist puppetmaster conspiracy in Chicago is Obama's idea of impressing his Jewish guests? Readers- I'd also like to call your attention to the new conservative humor website "It's Big Fur Hat" which showcases words, cartoons, interviews, and rib-tickling (or rib-cracking, if you're a liberal) graphics from Big Fur Hat himself- the creator of the delightful comic "The Obamas" and one of the most popular contributors to the also excellent website "I Own The World." Check 'em out...the more we laugh, the more nervous the liberals get! To help scare up money for his reelection efforts, Barack Obama continues to offer $3 raffle tickets to win a chance to eat with him, eat with him and George Clooney, eat with him and Michelle, share cocktails with him and Sarah Jessica Parker, take an Oval Office "spots and stains" tour with him and Bill Clinton, and other appallingly liberal dream dates. But there is ONE lotto ticket Hope n' Change would happily buy - and that's the one which would give us a front row seat to Thursday's unbelievably uncomfortable meeting between Barack Obama and former President George W. Bush, who is coming to the Whitehouse for the unveiling of his official portrait. For the past four years, Barack Obama has disparaged, mocked, and blamed George W. Bush for everything which is wrong with our country - with a special emphasis on those things which have gotten a helluva lot worse under Mr. Obama himself. Just last week, the world's most powerful golfer accused Bush of creating sneaky tax breaks for the "wealthiest Americans," savaging the education system, and stealing healthcare from the elderly...all of which is a pretty good trick for a guy who seems to be spending most of his time working with wounded veterans. Meanwhile, the eternally classy George W. Bush has shared virtually no public criticisms of the scurrilous little anti-American Marxist crapweasel who is using the Whitehouse as a litterbox - though we're thinking that Bush's powerfully gritting teeth should be looked at as a potential source of renewable energy. All of which means that the Secret Service had better be wearing parkas on Thursday, because things are going to be absolutely icy in the Whitehouse when the two presidents pose near Mr. Bush's new portrait (a portrait which Mr. Obama fought vehemently against because it is "oil-based"). 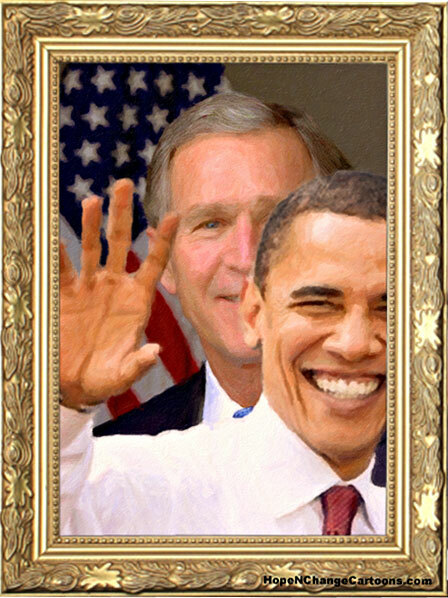 Of course, an official portrait of Barack Barry Hussein Soetoro Obama will eventually go on display in the Whitehouse, too - though it's expected that it will take a very, very long time to paint. Because the official Obama portrait will be "paint-by-the-numbers" and there are already 16 trillion empty spaces which need to be filled in. On this Memorial Day, please take time in your thoughts to express gratitude to those who have died in the service of our country...and give thanks for those who served and returned to their homes and families.